Synopsis: How is it that two broadly similar systems of competition law have reached different results across a number of significant antitrust issues? 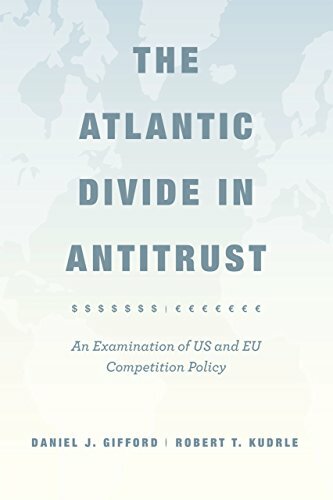 While the United States and the European Union share a commitment to maintaining competition in the marketplace and employ similar concepts and legal language in making antitrust decisions, differences in social values, political institutions, and legal precedent have inhibited close convergence. With The Atlantic Divide in Antitrust, Daniel J. Gifford and Robert T. Kudrle explore many of the main contested areas of contemporary antitrust, including mergers, price discrimination, predatory pricing, and intellectual property. After identifying how prevailing analyses differ across these areas, they then examine the policy ramifications. Several themes run throughout the book, including differences in the amount of discretion firms have in dealing with purchasers, the weight given to the welfare of various market participants, and whether competition tends to be viewed as an efficiency-generating process or as rivalry. The authors conclude with forecasts and suggestions for how greater compatibility might ultimately be attained. About the Author&colon; Daniel J. Gifford is the Robins, Kaplan, Miller & Ciresi Professor of Law at the University of Minnesota Law School. Gifford, Daniel J and Kudrle, Robert T.